Daydream/Eyeworks/Olympus Productions - 115 min. Cast: Hugh Laurie, Eka Darville, Florence Korokoro, Xzannjah Matsi, Tapiwa Soropa, Kerry Fox, Healesville Joel. . Crew: Writers: Andrew Adamson from the Lloyd Jones novel; Director of Photography: John Toon; Editor: Sim Evan-Jones; Original Music: Harry Gregson-Williams(score), Tim Finn(songs); Production Designer: Grant Major; Costume Designer: Ngila Dickson; Art Direction: Jill Cormack, Mark Robins; Set Decoration: Megan Vertelle; Makeup and Hair Designer: Gabrelle Jones; Special Effects Supervisor: Richard Schuler; Producer: Andrew Adamson, Robin Scholes, Lesie Urdang, Dean Vanech; Director: Andrew Adamson. A coming-of-age story about the loss of innocence and the power of imagination and how literature can inspire and change one's life. The setting is the 1990's in Bourgainville New Guinea during armed rebellion. Most of the Europeans have left and therefore the school was closed, so a former actor, married to a local women, decides to distract the children with literature, focusing on Dickens' 'Great Expectations'. One student's fascination with the novel raises the eyebrows of her Bible bashing mother, who sets out to bring an end to the readings and in the process throws the villagers into the firing line of the PNG army that has been sent in to weed out the rebels who have shut down the local mine. Highly Recommended. 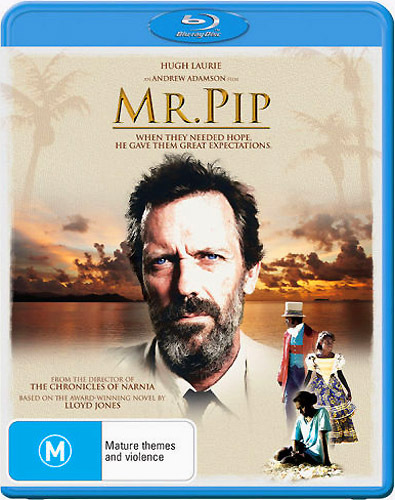 Starting 12 March 2014, PAL R4 dvds can be purchased from Australian sources, selling for $30-35au. It is presented in its original 2.35:1 16:9 enhanced format, with a DD 5.1 English language track and optional English subtitles. The only extras are interviews with Adamson (6:35) and Laurie (5:05). The ALL REGIONS Blu-ray is a 1080/24p with a DTS HD Master 5.1 spoken English soundtrack, optional English subtitles and an optional English descriptive narration audio track for the visually impaired. It also contains the same interview extras found on the DVD. However the Interviews are presented 576i with an English DD2.0 soundtrack and no subtitles. Copies are being offered by Australian resellers for $35-40au. Both DVD and Blu-ray version will become available from New Zealand resellers starting 23 April 2014, selling for $35-40nz for the DVD and $40-45nz for the Blu-ray. Starting 11 November 2014, an NTSC R1 DVD version is available from North American Resellers for about $15. There is no known soundtrack CD for this title. Louise Keller and Andrew Urban Reviews at Urban Cinefile.